Chandratal Lake in Spiti Valley is among the most picturesque destinations to visit in India. Albeit smaller in size when compared to more popular ones such as the Moriri or Pangong lakes, Chandratal Lake is no less beautiful by any measure. In fact, camping by Chandratal Lake at night is among the top things to do on a trip to Spiti Valley. Named owing to its crescent shape, Chandratal or Moon Lake is sprawled across a little over 2 km. 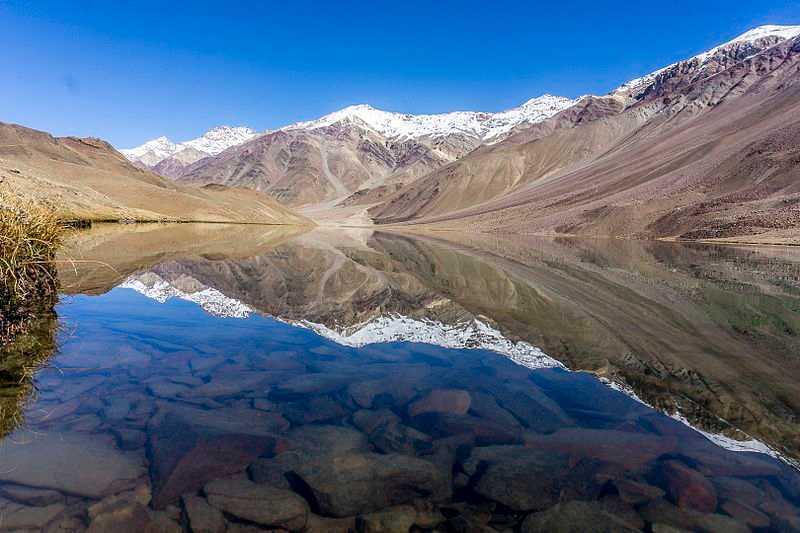 Reportedly made up of sweet water, the lake was found by traders coming from Tibet and Ladakh. It’s the most fascinating Chandratal Lake history tidbit ever. This is among the top places in India that deserve more travelers. However, a trip to this gorgeous lake is not one that should be taken even the least bit lightly. Being a high altitude region, travel to Chandratal Lake in Spiti Valley can be trickier than other common trips. For a brief overview and ways to do Chandratal Lake visit right, check out our travel guide below. Chandratal Lake is not one of those easy trips you can make on last minute flights. It needs careful and well-thought-out planning. The spectacular lake is accessible from both Shimla and Manali. It is fastest to reach Chandratal Lake in Spiti Valley via Manali rather than Shimla. However, all routes from Shimla and Manali to Chandratal are good. It’s up to you to decide which of the two you prefer. Take a look at the routes you can choose from in order to reach Chandratal in Spiti. Pick any of the above routes to reach Chandratal Lake in Spiti Valley as per your convenience. You can check Chandratal Lake trek maps, pictures, and camping facilities online among other exciting things to do before heading out. You can’t just expect to book a couple of business class flights and land in Chandratal. It isn’t as simple as that. Since it’s not among the ordinary or common regions to visit in India, you will require a permit to visit Chandratal Lake in Spiti Valley. In the event that you’re using your own car to travel to Chandratal, you will need to get Rohtang permits to do so. You can get these at the SDM office in Manali. Traveling via motorcycles will also require you to take a certificate of undertaking from the SDM office, Manali. These permits will get you hassle-free entry to Rohtang Pass in order to reach Chandratal. For further details or to book the Rohtang Pass permits online, click here. There are no hotels to stay at Chandratal Lake in Spiti Valley. You will only be able to stay at campsites here. Charges for these are approximately INR 1500/- and above (charges may be subject to change) per individual. These include food costs as well. DO NOT self-camp on the banks of the lake. It is prohibited and highly dangerous. If you wish to stay at a hotel, there is a sole PWD guest house located at Batal. Travelers on a tight budget can stay at Chadar tents provided at Batal. At the very basic, these are just regular dhabas under massive tents that have a couple of beds put out. Charges include anywhere from INR 100 – 200 (charges are subject to change) per person per night. Altitude sickness is very real and it can be very uncomfortable to bear. With Chandratal Lake in Spiti Valley being over 4,300 meter high, you can expect to be hit with at least some level of altitude sickness. If the sickness takes over when you’re at Rohtang Pass and still on the way to Chandratal, you should avoid going straight to the lake. Instead, head to Kaza before nightfall to try and recover. Make the trip the next morning when you feel better. However, if the altitude sickness persists, it’s best to avoid the visit and stay at the lake. Travel back to town and seek medical attention. The closest airport to Chandratal Lake in Spiti Valley is the Airport in Kullu. This is connected to major cities in India via cheap domestic flights. For instance, you can book cheap flights to Delhi first and then take a connecting on to Kullu from there. Alternatively, you can arrive at the Jubbarhatti Airport near Shimla as well. Cabs and taxis will take you to Chandratal Lake from outside the airport. The spectacular Chandratal Lake weather is best during the summer and this is the only time the lake is accessible. This is because the lake waters freeze during winter and the region remains cut off from the world (barring a few extreme adventure enthusiasts who dare to brave the freezing Chandratal Lake temperatures). Thereby, the best time to visit Chandratal Lake in Spiti Valley is between the months of June and September. This is the ideal time for you to book flight tickets to India for a trip to Chandratal Lake in Spiti Valley. You will find several other travelers camping and taking in ethereal sights during this time at Chandratal. 7 Solidly Impressive Reasons to Visit Chicago Right Now!